Those of you, who regularly read my column, River Currents, know that I’ve lived on the Lower Wisconsin River for over 25 years. Everyday when I wake up, I’m looking out on the Wisconsin River. The river has played a part of my life with its four season beauty, the many kinds of waterfowl and birds that make this its home, the animals that I regularly see and of course the fishing. The one thing that many people don’t realize or notice is that the Wisconsin River is constantly changing. Unlike a lake that is stable, rivers are a dynamic force that flows and changes everyday of the year. I can look out my window and tell you whether the Wisconsin River is up or down that day. The constant current or flow changes many things regularly like the depth, contours, fish location, and structure. This spring has been another “different” one with the continued high water which has been at a constant high level most of the spring. In my many year living on the water, this year is one of the longest and continual periods of high water that I can remember. Every year, there is always high water after the spring melt-down of winter’s snow and the spring rains. But, the high water never has lasted as long as this year. The water flow is controlled by Alliant Energy which controls most of the dams up and down the Wisconsin River. The dam at Prairie du Sac is the last dam before the Mississippi River some 85 miles downriver. The water is controlled by Alliant at the dams up and down the river. There are dams at Prairie du Sac, Wisconsin Dells, and Castle Rock which always affect this area. The water depth on Lake Wisconsin is strictly controlled and the water is not allowed to vary much because of all the nice houses. To avoid flooding, more water is allowed to pass through the dams to keep the water level stable. Lake Wisconsin may have more current and flow during high water times just to maintain its constant level. I normally have a sand beach in my backyard, but this year I’ve had water up to my stairs. The beach and vegetation is all under water and has been for weeks. This past weekend was nice before the Sunday night storms and you’d expect to see may people on the Wisconsin River canoeing, boating, kayaking, tubing, and fishing. You’d expect the canoe rental businesses to be busy with people enjoying the beauty of the Lower Wisconsin River. But, I saw only a few people on the water all weekend and most of those people were fishing. The river flow which is measured in cubic feet per second with the normal flow now being about 4,000 c.f.s. But, the flow this weekend was 25,000 to 29,000 c.f.s. which is a extremely high flow and covers most if not all the islands and has flooded much of the lower land. The reason that there wasn’t many people might have been that the water was too high and flowing so fast that it was dangerous to go on the Wisconsin River for liability reasons and no where to camp. I haven’t complained about the rainfall and high water this spring because it was just last summer when we had a drought for weeks on end that left the Wisconsin River so low that you had to watch your travel because of the many obstructions, rock bars, trees, stumps, and areas that normally have water there dry. The year’s when we have prolonged high water change the river’s structure usually for the better and help the spring spawn of most fish species while open up river areas that have been usually above the water. I’ll never be one to complain about too much precipitation and high water. Just look at the large number of trees and perennials that died from the heat and drought of last summer. 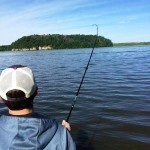 High water is a time when many anglers have problems finding fish. 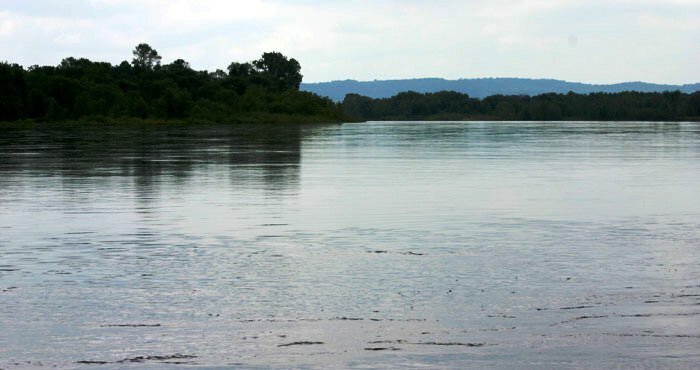 The most important thing to remember during these periods of high water on the Wisconsin River is to fish shallow out of the strong river current. All river fish, even in times of normal water, try to position themselves so that they have something to block the river’s flow. River fish burn up energy everyday fighting the current and that’s also a reason that weather doesn’t affect fish that much because they have to eat every day just to maintain their body weight. River fish will hide behind rock piles, brush and timber, islands, river turns, bridge abutments, depressions in the river bottom, and anything else that will block the current. 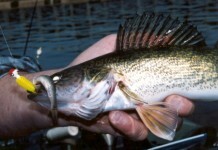 Ideally, a river walleye would like to hide behind some cover and wait for some food or forage to float by, dash out and grab it, and return to their location out of the flow. Most fish are in the shallow water and flooded areas when you have these high water conditions. Try getting your boat out of the current and pitch jigs and lures into open pockets. The forage fish which make up a fishes diet are in the shallow flooded brush and out of the current. 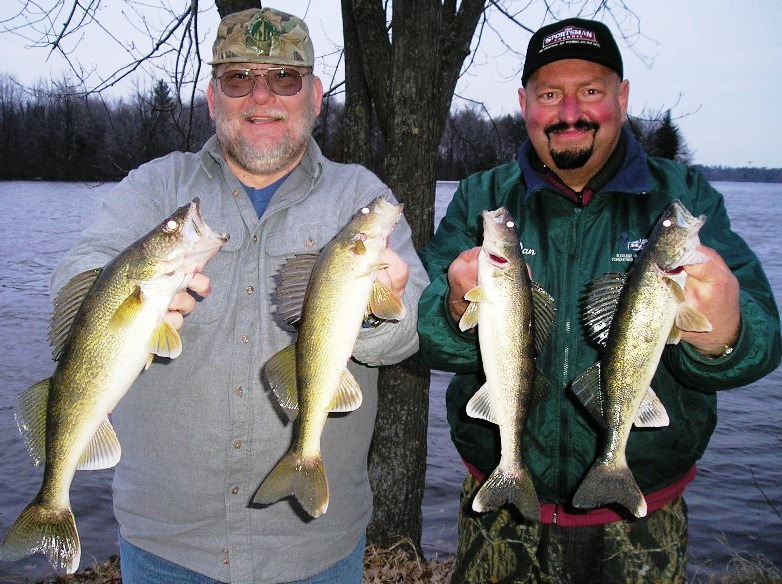 These are the locations that you want to fish when the Wisconsin River is high and flowing fast. I went out with my neighbor on Sunday and he wanted to troll. So, we trolled for a few hours and caught a few walleyes and saugers. But, not what we usually catch in normal water times. 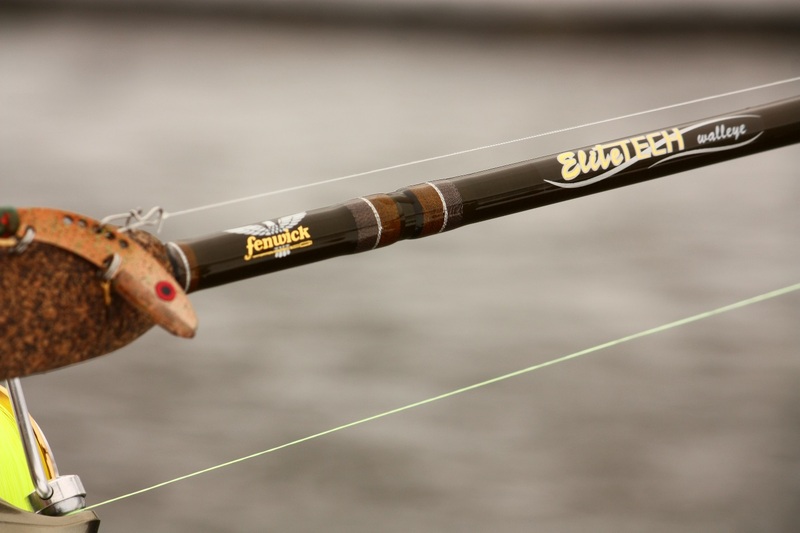 To get and stay shallow, you may have to anchor or use a push pole to get into these backwaters where the fish are now located. Pitch jigs and plastics or use a slip-float in these shallow locations. I was at the Prairie Dam the other day and the gates were open with a strong water flow. There were a few anglers sitting in lounge chairs fishing the slack water out of the current. These anglers were fishing a hook, split shot, and red worms which they casted out and let sit on the river’s bottom out of the current. To my surprise, these fishermen had some baskets with very nice bluegills and perch. 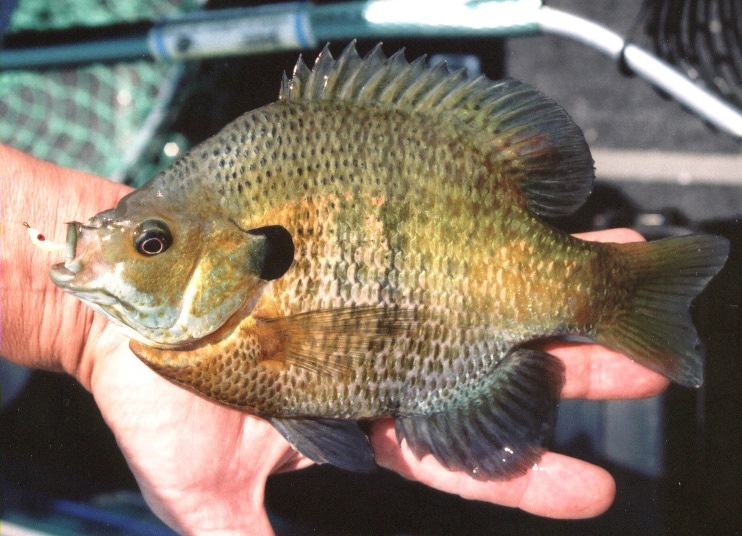 I don’t panfish in the river much because I’m usually concentrating on walleyes and muskies. But, this is just an example of the fish going shallow during high water and current. I’m sure that you’ll also find walleyes shallow too if you keep searching for them. Shore angler can do better at times because the water that they are fishing is shallow and doesn’t have much flow. Remember to go shallow when you’re facing high water conditions. 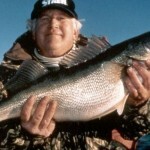 Adapt some of the tactics that you might use when bass fishing and always wear your life-jacket. Be safe! Don’t Put That Boat Away Yet! 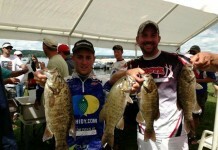 I Like To no what Kind of Fish is and the Wisconisn River in Portage,WI I Like To No. If you’re looking for more info on the species of fish or looking for tips, we’d suggest checking out the Wisconsin River (Below Wisconsin Dells Dam) waterway page on Fishidy. 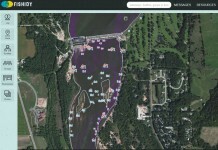 Here’s a direct link: http://www.fishidy.com/map/us/wisconsin/wisconsin-below-wisconsin-dells-dam. 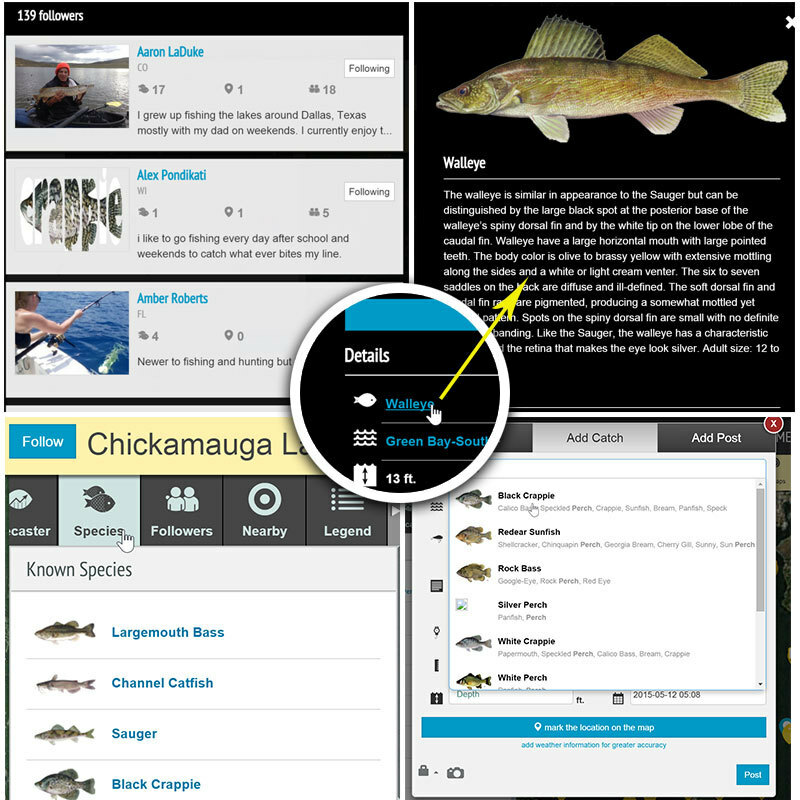 You will need to login to your Fishidy account to view the map and interact with other members. There are currently 256 other members following on that waterway. Good luck!